The predecessor of writings is oral transmission. The predecessor of films is the theater. In the last years we witness the 'digital revolution'. Computers, digital filmmaking and ebooks read on tablet PC's replace traditional printings and movies on real films. As George Lucas, the director of Star Wars, stated: "I will probably never ever shoot another film on film". Writings are a much more reliable source of information than oral transmissions are. That is because it is checkable again and again. In ancient times writings were made and copied by handwriting, a long and artful procedure. In medieval times that was mostly done in monasteries, who hosted the best libraries of the western world. That was not always much. The Vatican library in Rome consisted of some 500 pieces of writings when pope Nikolaus Vth became pope. He was very ambitious in expanding the Vatican library. When he died 1455 CE, it consisted of some 1.500 books. That was at the time when Johannes Gutenberg was working on the invention of the printing machine. Most of the writings were texts from the Bible and Christian writings and songs. Others were antique writings, but they weren't very appreciated by the church for their content was considered pagan. One of the two outer libraries of Angkor Wat in Cambodia. The Angkorean empire, as well as it's predecessor of Funan, housed a considerable amount of literature. Unfortunately absolutely nothing has survived the tropical climate of Southeast Asia. The works were written on palm leaves, covered with a dark paste and the letters were written on that with a kind of a bamboo stick, used as a pen. The Angkorean literature consisted probably mainly of religious works, but maybe, highly probably, there was more. That's all is a comparably little amount of works. Nowadays many private libraries house much more than that. Big libraries like the British National Library consist of an astronomic much more placement than the Vatican Library some 600 years ago. A huge change came up with the technical innovation of the printing machine. Suddenly it was possible to copy a certain writing much more efficient and faster in great numbers. The monopoly of the monasteries was broken and more and new ideas could spread out. Martin Luther translated the Bible, which was then available only in Latin, into German language. From then on, many common people who didn't learn Latin, could read the Bible themselves, and the monopoly of the Catholic priests was broken. That lead to a revolt agains the Catholic church and to a long period of bloody wars, especially in middle Europe. Besides Luther's Bible translation was the foundation of the modern standard German language. 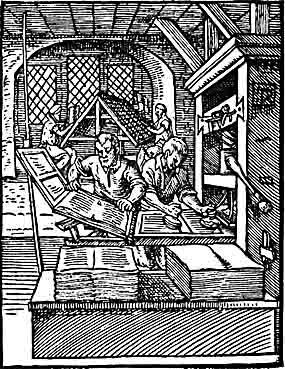 Nowadays we face a kind of a second Gutenberg revolution. It's the digitalization and the internet. Here anybody can be an author for cheap money, spreading out his ideas. Copying texts is easier than ever before - we use now 'drag and drop'. But, most important is the quality of the information. Although printing press and internet overflood the world with a huge amount of crap, there is, of course, also a lot of relevant information available. Wikileaks is just one example how relevant information in our times can move a lot. Who is interested and searches for good information and ideas will find plenty of it. Movies are a completely different media than books are. The effort to produce a film of any kind is much higher than to produce texts. Since most productions are for TV or cinema, they require a team of specialists and high budgets. That means that the economic factor in filmmaking is very strong. It's an investment and it's made to pay back. Most productions from the culture industries we get to see are addressed to the masses as easy entertainment. It has no significance. A great deal of it is just commercials or political propaganda. The big producing industries or TV channels are in a high degree monopolized. They are owned by a few rich people who can decide what is produced and what not. Doubtlessly, the permanent consumption of this mass production keeps people silly. Nevertheless is here and there among all the crap a pearl to find. Good movies can be like a dream, letting us see things different than they appear in all day life, using a symbolic language. Movies can be shaking, documentaries can reveal sights we wouldn't discover without seeing them. Movies are an artistic expression in many kinds. Since Asienreisender focusses on Southeast Asia, here are some handpicked examples given.